Area of effect: a term used to describe an effect that affects multiple targets within a specified area. 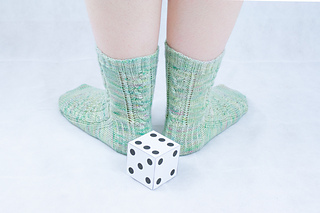 Take a dice and roll it as if your knitting depends on it because… it does! Area of Effect features two kinds of cables and an eyelet panel. 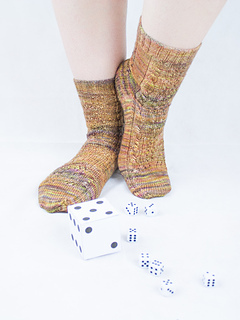 Each of them is defined through a dice roll which gives each sock its special random and unique look. 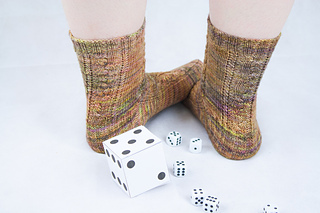 Worked from the cuff down, Area of Effect is perfect for (semi-) solid or slightly variegated yarns. 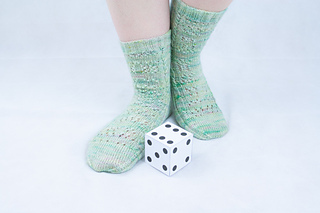 Cable needle; tapestry needle; a 6-sided die or a random dice app. 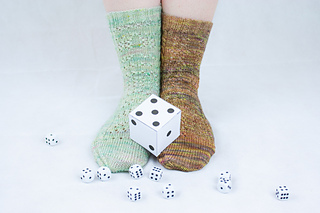 You can use random.org for random numbers if you don’t have a die. Use a minimum of 1 and a maximum of 6 for the numbers.